When I first came to New York one thing I noticed was how people love to wear the name of their city on their heads, chests, behinds and even on their feet. To be clear I mean regular New Yorkers, not tourists. 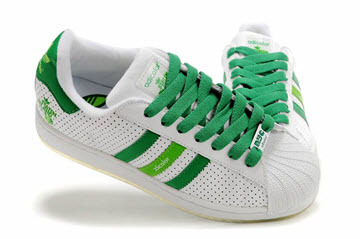 I just had a flashback to the Adidas Adicolor Staten Islands I was so proud of – fresh! Adidas Adicolor kicks – A design for each NYC borough. Fast forward to October 2014 and the launch of .NYC seemed like a nobrainer. In my mind not all gTLDs are created equal and .NYC just clicked. Firstly, .NYC is short and equal in size to .com which felt natural and it had a brand more fiercely loved and protected than .com. Secondly, nexus requirements helped to keep registrations local and gave businesses a great opportunity to secure their name as a .NYC domain or to rebrand their website with a name they always wanted but could never secure as a .com without much deeper pockets. An added draw for me is I teach at a high school and am used to my “@schools.nyc.gov” email address and daily work websites so .NYC feels familiar as it probably does to city workers from other agencies. 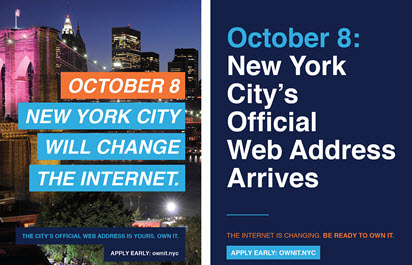 One of the original ads before the launch of .NYC in October 2014. With the City of New York behind the application for the TLD this also gave registrants the added security that its growth and success would be supported no matter which company was chosen to manage the technical part of registry services. The City of New York chose Neustar to provide registry services and I feel that the first 2.5 years have seen success with 75,000 domains registered and my daily sightings of new .NYC sites around the city, but I sense that .NYC hasn’t yet broken through to the masses (and maybe 2.5 years just isn’t enough time). There was excitement in the first landrush auctions which was shown in the auction results. Since that time, there have been other exciting periods for investors and end users with the release of the collision names and previously reserved premium names as well as the ‘living’ and ‘fashion’ themed auctions. Each time I see .NYC domain names used in the subway, on the radio, bill boards and even more often just casually on storefronts, I’m excited and encouraged. When I occasionally chat with business owners about their .NYC website they describe a sense of pride that their domain has a clear affinity with the city and some even believe that there is a benefit to local marketing efforts including SEO – I think it’s too early to know. In March 2017, we’re now at a pivotal moment where I believe the City of New York, Neustar or even an outside agency must be tasked with creating a clearly defined plan to continue building the excitement behind .NYC and promoting it to locally focused businesses and organizations so they adopt a new home on the web. For many businesses, it’s that they simply don’t know about the opportunity: they wear the NYC cap and NYC t-shirt but they don’t know the steps to put on a .NYC website. For others, they don’t have a feel for the state of .NYC and are taking a wait and see approach. 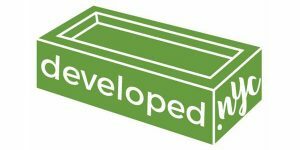 A few weeks ago I created Developed.NYC and started tweeting with @developednyc to show the state of .NYC by highlighting the growth of the NYC domainscape. The site is a simple directory and map showing pushpins across the city of businesses who have embraced .NYC and developed websites. It’s another no brainer and I’m not sure why the City of New York or Neustar didn’t create such a tool. Registrations are one metric but potential registrants have to see where these names are actually being used and developed into full websites to be converted. In the few short weeks since putting Developed.NYC together I’m inspired by what I’ve found: cafes, bars, delis, photographers, ad agencies, politicians, gyms, festivals, charities, stores, apartments, real estate agents, schools, colleges, bands, museums… the list goes on and on. Every imaginable business and organization is represented with a .NYC website. This is exciting and it signals the success of .NYC. While I remain an optimistic .NYC developer and investor, I’m hopeful that the City of New York, Neustar or an external agency will craft a message promoting .NYC ownership and what it demostrates to build on a .NYC: city pride, prestige and affinity. This is the story that needs to be told and shared. Matt Gill is the owner of Developed.NYC and other NYC websites including Kids.NYC. He is also a computer science teacher in Flushing, Queens. No, it was not a sponsored article. that has helped us show the grow of .LA real websites. @mobile not a sponsored post. Just a bit of my story and view of .NYC. @Page Thanks for the comment. I think there is a great opportunity for .NYC and .LA. Looking forward to some throwdowns. Looks great! This sort of resources is what current official .nyc site is missing. Good luck with the projects! Thanks DK. It really was a no brainer for the the City or Neustar to create a map like this. Why didn’t they? They have to commit to this project and .NYC will grow much quicker and will be the first choice of adoption by New Yorkers. In creating the directory I found .coms being used as forwarders to an owner’s .nyc domain. That commitment needs to be celebrated. There is a real love for this city and developing a .NYC shows it. I’d like to see the author comment on the recent .NYC auction here. I have history in NYC myself, maybe more history than this author. There’s no two ways about it: the low prices for the recent .NYC were not just puzzling, but insane. Perhaps this author may even have knowledge of the famous Crazy Eddie commercials. The prices were not just insane, but bonkers, as in stark-raving-mad. I’d also like to know where the author was when this auction went down. Did he get any at those greater-than-steal prices? If I still had NYC nexus I would jumped all over an opportunity like that. 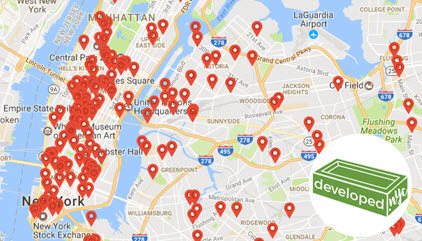 By the way, if you want proof how insane most of the prices were, you verify that here: http://domainnamewire.com/2017/02/28/fashion-nyc-domain-name-sells-37000-shop-nyc-sells-33500/#comments. John, I was driving during the last 20 mins of the auction and pulled over to take part. I was ready to snipe hoping to but as cheaply as possible. I liked models and deals which I think went for ~$2,500 and $4,500 (from memory) and so I was priced out when I went to bid on sneakers and suits, SnapNames app and mobile website didn’t show me the bid button. It was really frustrating because even my attempts to load the SnapNames auction as desktop version wouldn’t show me the button to submit my bid. I read comments after the auction where others had the same issues as I did and even chatted to someone else bidding during the auctions and they said that they had the same problem and had to use a desktop. For me I was frustrated, but I have some great names I need to develop, I probably should limit my spending and was ok with others buying hopefully to develop. Earlier this year I bought cakes.nyc for $20 – so many great names free to reg or expiring. As for the problem with the auction, obviously this shouldn’t happen. Things should be completely tested. Neustar moved the auctions to SnapNames form NameJet and although they should be prepared (after all auctions are what they do) they weren’t. Also the switch may have confused some people, but more than that it just wasn’t marketed well enough. Thanks for your reply, Matt, sorry to hear that. Yes, some great NYC gems there. I have a .NYC .com that gets *tons* of checks, much more than I knew till recently. .NYC is one of the (super) few truly great new TLDs imo. If I was still in NYC I would have felt extremely fortunate to get (*and use*, not just sell) some of them. Speaking of this issue and Neustar, .US is also still what it has always been – a true “sleeping giant.” It is also one of the few truly great TLDs from an end user and “true potential” perspective. The problem, among a few others, is that the American public still simply practically doesn’t even know that it exists for all intents and purposes. I could certainly say more about why that would be so. Did you ever see the “Crazy Eddie” commercials I mentioned? A true NYC icon of yesteryear that still resonates with those who know. Those prices for the .NYC domains that went for peanuts this time are so “insane” that you would have to redo those commercials and have the Mayor of NYC in them being put in a straight jacket and dragged off the screen declaring just how insane they really were. Crazy Eddie was before my time 🙂 – I was expecting the ads to be for cars but maybe that’s another iconic TV ad… I now see Crazy Eddie was TVs etc.! Neustar’s .biz and .us haven’t achieved what they should have imo and I hate to say it but I’m not sure if Neustar are a risk to .NYC. Not by mismanagement of regular registry services, but purely by a lack of marketing. They do so much in terms of other services, I wonder how important are these TLDs (including .NYC) are to them? They won’t catch on all by themselves, but with careful nudges and promotion it will snowball. I think that there is a risk that if a TLD doesn’t achieve at least moderate success within the first 3-5 years then it’s game over. .NYC is doing really well so far 75k local regs and significant development, but marketing should be relentless. .NYC is an easy sell and those who know, buy into it, while those who don’t know have no idea about what they’re missing out on. I share your feeling that .NYC is one of the few great gTLDS. These are interesting times and the next premium .NYC auction themed “Tech in the City” will be another indicator of growth, adoption and sentiment. Nice article. At some point, that map will be so full of markers that there’s no map left to see. The more people see .NYC as they move about the city, the more they’ll connect the dots. Thanks Joseph. Many NYC developed websites that I found didn’t have a published address on their website, essentially they weren’t fixed to a street address and were for a city-wide cause. For these websites I just used the address of “NYC” which has put around 70+ developed .NYC websites all on top of the same pushpin in lower Manhattan. So the map should really look more populated than it does. However, there are areas in Staten Island and the Bronx that are looking a bit bald!